This essay looks at highlights from one of the two photo albums in the MHS collection inscribed with the name “Fredonia Wilson” on this inside front cover. Fredonia Clowes Wilson (1864 – 1950) of Milton, daughter of ship carpenter Theodore Wilson and Aletta Ann Conwell, was active in church and other social organizations while she lived in that town. Known to her friends as “Dona,” she married William Charles Lofland (1860 – 1922), a hotelier, in 1886. Sometime after the group portrait (Figure 2) was made, she and William moved to Lewes were they managed the Virden House hotel together. “Dona” has the distinction of having been appointed postmaster of Lewes in 1916, replacing the previous holder of that position, Ebe Lynch, who was murdered. The appointment was made on the recommendation of U. S. Senator Willard Saulsbury, a recommendation may have been due to the fact that Dona’s husband was a personal friend of Senator Saulsbury and fought very hard on the senator’s election campaign. This appointment resulted in a lot of ill will against the Senator by other contenders for that same appointment, which was quietly resolved with other appointments. All of the photographs in this article were obtained from the same collection. For the most part, they are “cabinet cards,” “cartes de visite” (CdV), and ferrotypes (“tintypes”). 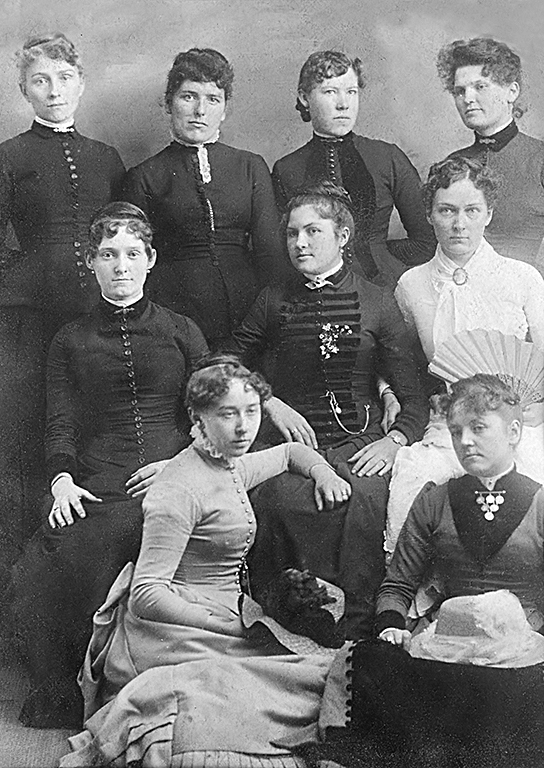 The first photo in the album, shown as Figure 2 below, is a group portrait of nine young women, all in their late twenties to early thirties, including Fredonia. 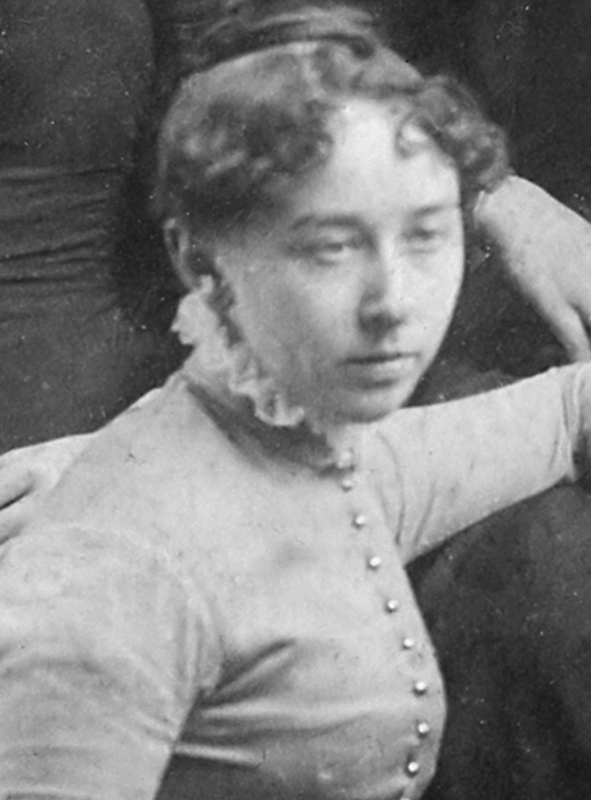 Given that she as well as Hannah Black Lacey are identified by their married names on the album sleeve in which it is set, the photo has to have been taken sometime in 1889 or later. The more intriguing question is, what were the relationships among these women that would lead to a group photograph? 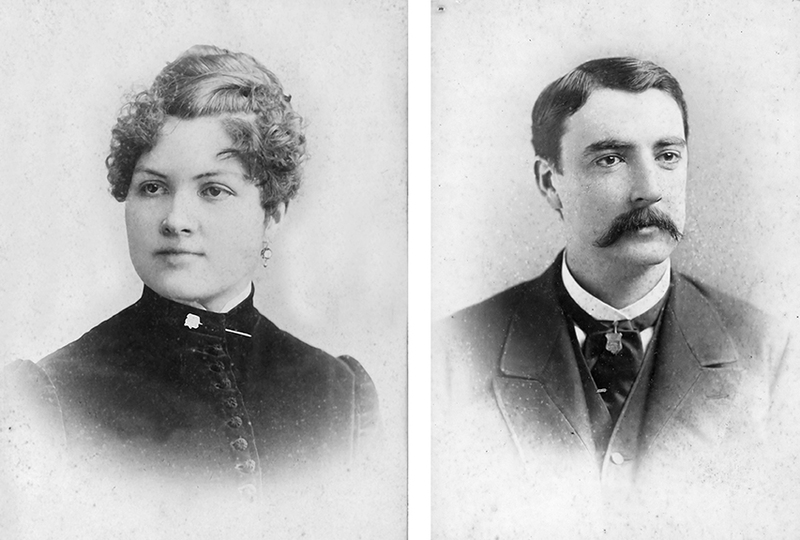 Only Fredonia Wilson Lofland and Sarah Lofland are related, the latter being Fredonia’s sister-in-law. Several of the women lived on the same street in Milton, just a few houses from each other; even for a group of friends, that would hardly justify a trip to Wilmington or Philadelphia to visit a photographer’s studio, or even employing an itinerant photographer locally. There are two other possibilities. One is that the women belonged to the same church service group, and the other is that they belonged to some other organization that would hold meetings or attend conventions – an organization that perhaps might provide a photographer for the membership. Through newspaper reports and minutes of the monthly meetings of the Milton chapter of the Woman’s Christian Temperance Union, we know 7 of these women were W. C. T. U. members over a twenty year period from the late 1880’s to the mid-1900’s: Lillian Cade, Hannah Black Lacey, Sarah Lofland, Emma Maloy Corkran, Clara Starkey, Mary W. Brockinton and Rilla Pennewill. We also know that Lillian Cade and Clara Starkey were members of the Epworth League, which many women belonged to. While further research is needed to confirm it, it is quite likely that ALL of the women in this group portrait where members of the W. C. T. U., and that this affiliation is the basis for the portrait. It is not a far-fetched conjecture that the prominence of the group portrait, being the first in the album, indicates the importance of the group to Fredonia Wilson while she still lived in Milton. 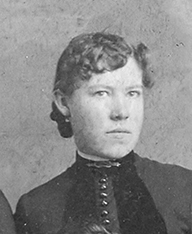 Hannah Elisa Black Lacey (1859 – 1940), daughter of ship carpenter Thomas Lank Black and Eliza Robbins, was the wife of Capt. Charles Franklin Lacey (1853 – 1924), whom she married in 1889. She was an early member of the Milton chapter of the Women’s Christian Temperance Union. It is likely that she and her husband spent a great deal of time apart during his time as a sea captain; the Milton News letter frequently reports “Capt. Frank Lacey is with his family,” indicating many periods of absence. Capt. Lacey retired from the seafaring life around 1909, possibly motivated by his harrowing ordeal at sea in 1908. He became a major stockholder of the S. T. T. & S. D. Co. (more simply referred to as the Sussex Trust Company), a local bank that built and occupied the building that was until recently the Federal Street Gallery and Espresso Bar. In 1925, a year after his death, the Wilmington Morning News of March 13 reported that his estate was valued at $11,146.48 or about $152,372.38 in 2016 dollars. Philadelphia Times, June 16, 1901 – She is elected president of the Sussex County WCTU. Report of the Biennial Convention and Minutes of the World WCTU – She is listed as one of a number of delegates from the U. S.
New Castle News, Dec. 18, 1908 – Lillian Cade, president of the Sussex County WCTU, teamed up with her counterparts for Kent and New Castle counties to demand of Governor Pennewill that the new battleship Delaware be christened with a bottle of water rather than the traditional champagne. Delaware County Daily Times, Nov. 22, 1928 – She attends the National Convention of the WCTU in Boston. There was no occupation given for Lillian; presumably she had the wherewithal to pursue a life as a full-time activist. One astonishing article, from the Wilmington News Journal of November 7, 1950, reported that, at the age of 95, Miss Lillian Cade was not only still actively participating in meetings of the Milton W. C. T. U., she also attended the state convention of that organization a month earlier. Rilla Pennewill (1867 – 1936) was a dressmaker, organist for the M. E. Church and sometime music teacher, and lived near Sara Lofland’s family in Milton. She married Packer Finkbine (1858 – 1915) of Pennsylvania in 1907, moved with him to Chester, PA where he was employed in a steelworks, but was widowed just a few years later when he died of pulmonary edema in 1915. A few short notices in the The Delaware County Daily Times during 1915 indicate that she was sole heir and executor of the estate of her husband, but not much is know about her life after that. She died in 1936. 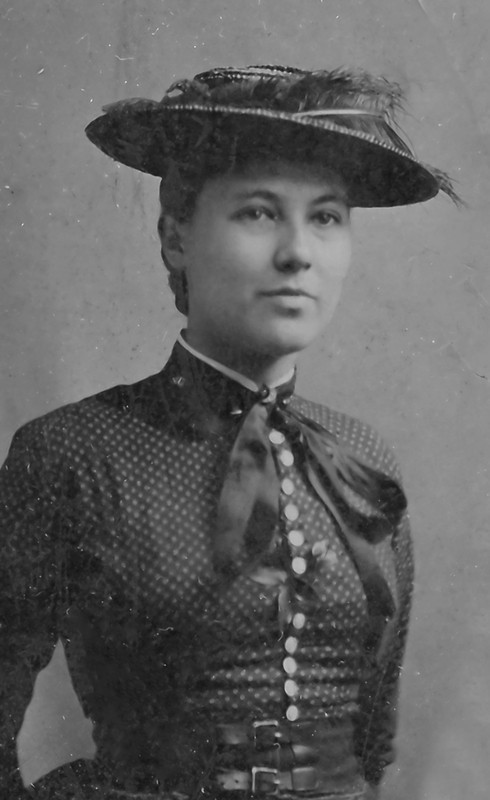 Sara Vaughn Lofland (1864 – 1952) was Fredonia’s sister-in-law, an active member of the WCTU, and a dressmaker. She lived her entire life in Milton, and never married. 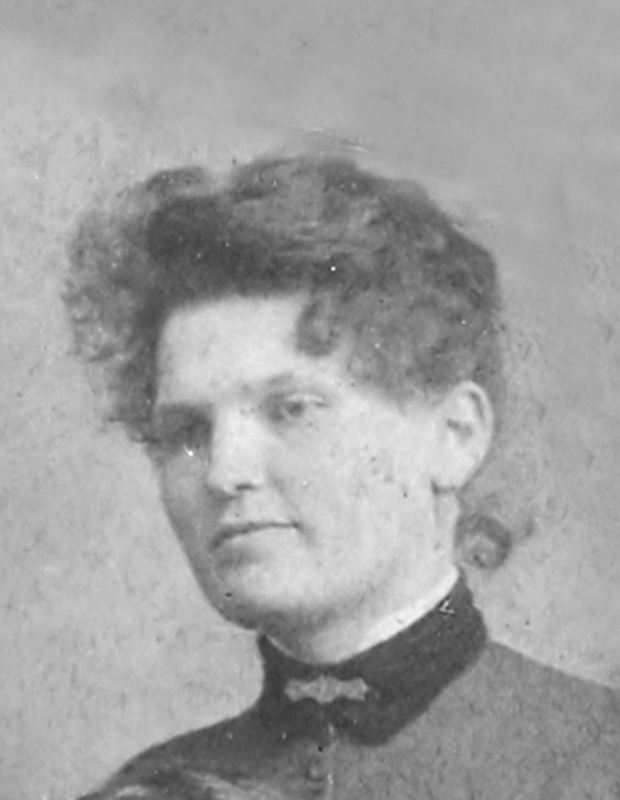 Margaret Primrose (1863 – 1920) was a neighbor of the Lofland family. Never married, she lived with her father Theodore E. Primrose until his death in May 0f 1907. After her father passed away, all of his property in Milton was sold off and she moved to Vineland, New Jersey to live with her sister Lillie Primrose Conwell and Lillie’s husband, Joseph Conwell. She would remain with her sister and brother-in-law until her death in 1920. She was buried in Milton. 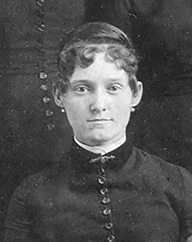 Mary L. Wolfe Brockinton (1865 – 1942) was the wife of Dr. William W. Brockinton (1857 – 1895), a South Carolina physician whom she married in 1885. Her name and that of her daughter, her only child, appear in the Milton News letter of the Milford Chronicle with some regularity in connection with the W. C. T. U. and other social activities. The most disconcerting item about her, however, appeared in the May 23, 1902 edition of the Milton News letter, describing what amounted to an attempt to mug her near the corner of Federal and Wharton Streets by an African-American stutterer named Fred Groves. Clara Wilson Starkey (1862 – 1953), daughter of Milton merchant John Wilson, was the wife of William T. Starkey (1859 – 1931), a Milton druggist whom she married ca. 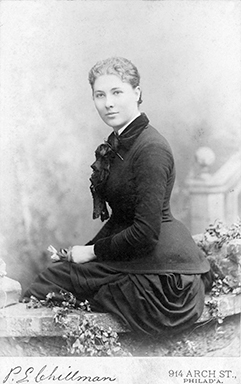 1887; before her marriage, she was the next door neighbor of Mary Wolfe. Her census data of 1940 lists her as completing the second grade, which would make her the least educated of this group of women, but not unusually so for her time and place. Her druggist husband operated a pharmacy in Milton for forty years, establishing his latest early in 1901. As late as 1967, pharmaceutical bottles with his name were being found by collectors. After her husband’s death in 1921, Clara lived with Mr. and Mrs. William H. Wagamon for the remainder of her life. Her obituary indicates that she was the secretary of the Milton W. C. T. U. chapter for 25 years. Emma Maloy Corkran (1865 – 1950), daughter of Rev. J. Earle Maloy, pastor of the Milton Methodist Protestant Church from 1884 – 1886 and wife of Dr. Millard Fillmore Corkran (1857 – 1916), whom she married in 1886. There is a story, possibly apocryphal, that Mary Emma Maloy Atkins was given her middle name as a token of admiration for Rev. J. Earle Maloy on the part Mary’s father, George W. Atkins. The photographer who took the group portrait was H. E. Elliott of Baltimore; his imprint can be seen on the back of the photograph. However, contemporary records indicate that Elliott was actually from Seaford, in Sussex County. He held two commercial licenses: one as a photographer, and one as a bricklayer. 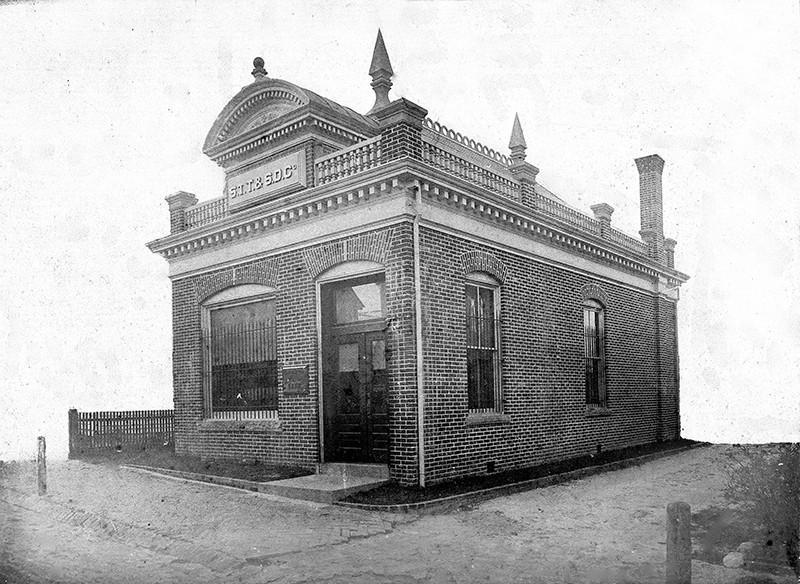 He eventually moved to Rehoboth, where he and his son were masonry contractors, and was involved in some of the reconstruction of Milton businesses after the fire of August 12, 1909. Although nothing can be found about his Baltimore studio, if he indeed had one, a short article in the Denton Journal issue of September 4, 1886 mentions that he “has pitched his tent in Denton where he will remain for a short time only.” The article then goes on to quote his rates for various sizes of prints. From this we can speculate that Elliott was an itinerant photographer rather than studio based, but this cannot be verified. This also suggests that the ladies of the W. C. T. U. would not have had to travel to Baltimore or Philadelphia for the portrait, but perhaps visited Elliott’s tent much closer to home. 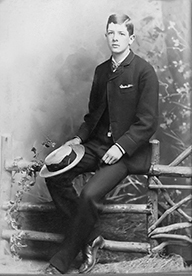 James Alfred Wolfe (1868 – 1954) was the brother of Mary L. Wolfe and thus Dr. William W. Brockington’s brother-in-law. His occupation on the 1900 U. S. Census is given as merchant broker. On their mother’s side, James and Mary Wolfe are the nephew and niece of Martha Emma Atkins Bellows. The Bellows siblings – William, Laura, Charles, and George – are first cousins to James Wolfe and Mary Wolfe Brockinton. James and Mary are also first cousins once removed to Margaret Atkins Fisher. Margaret Atkins Fisher (1864 – 1942) was the sister of George W. Atkins, making her the aunt of the Mary E. M. Atkins memorialized on one of the Lydia B. Cannon Museum’s stained glass windows. Her full maiden name was Margaret Coulter Carey Atkins. 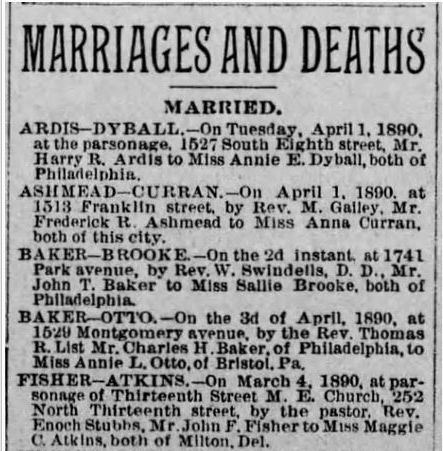 In 1890, she married widower Captain John F. Fisher, 16 years her senior, in Philadelphia. By all appearances, this was an elopement. The marriage was announced in the press, albeit in just a few lines of very small type. A beautiful banner designed and embroidered by Mrs. Maggie Fisher, wife of Captain John Fisher, of this town, was presented to the Sussex County W. C. T. U., at its late convention, held at Lewes. The exquisite workmanship is wrought on a black velvet ground, and stamps the lady who conceived the design and executed the embroidery as an expert in that line of artistic work. This report is the first time we hear of Maggie Fisher’s talent for artistic needlework, which would end up being the means by which she would eventually support herself. This is also the first indication that Mrs. Fisher was involved in some way with her community. Another mention in the Milton News letter of October 13, 1893, describes an idyllic-sounding trip that Maggie was to make with her husband, from Philadelphia to Galveston and then Mexico, on the schooner George T. Lane. The trip was planned to last until May of 1894, but as there are no surviving issues of the Milford Chronicle from that year, we don’t know whether the trip actually went forward, and if it did, at what point did the Fishers return to Milton. 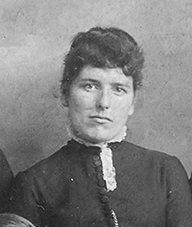 In the June 28, 1895, Maggie Fisher’s name appears in the Milton News letter once again, visiting someone in Lincoln, accompanied by her sister-in-law Miss Mary Fisher. After that, we do not have any references to her in any newspaper currently available to researchers. From a series of articles in the Wilmington morning and evening newspapers in December of 1924, we know that Maggie left her husband around 1899. Upon his death in 1924, there is no mention at all of Margaret Fisher in the Milton News letter or in any other obituary. Part of the mystery was revealed in a sensational report published in the December 29, 1924 edition of the Wilmington Evening Journal. Margaret Atkins Fisher had petitioned the Orphan’s Court in Georgetown for one half of the recently deceased Capt. John F. Fisher’s estate. According to the article, Maggie Fisher had not lived with her husband for 25 years, and was believed by John Fisher’s family to be dead. She in turn did not learn of his death until several months after the fact. In an article published by the Wilmington News Journal of December 24, it was stated that she had fled her home in Milton 25 years earlier out of fear that her husband would injure her; however, there is no easy way to verify that story. Capt. Fisher had died intestate. There was never a divorce or annulment, so as his widow, she appeared to be entitled to half of his estate under Delaware law – an estate valued at around $33,000 at that time, or about $450,000 in today’s dollars. On March 16, 1925, a little less than three months after the petition was filed, the Wilmington Morning News reported that the Capt. John F. Fisher property in Milton was sold at public auction to John P. Wilson for $3,520. It is possible that the case was settled out of court, and the sale of the house and lot in Milton were part of the liquidation of the estate for division of the proceeds. The actual outcome of her petition for one half of the estate is not known at this time, but will be researched and reported at a later date. Margaret was listed in the 1920, 1930 and 1940 U. S. Census as widowed and working at “Art Needlework.” Sometime in the early 1930’s she moved to Spring Lake, Monmouth County, NJ and lived there until her death, around September 18th of 1942, at the age of 74. She was found, according to the Wilmington News Journal, on the floor of her home, her feet showing just over the threshold of the front door, by an iceman making a delivery; she had probably been dead from a cerebral hemorrhage for several days. According to that same article, she had operated a needlecraft store for several years in Spring Lake. The Milton News letter in the Milford Chronicle of April 25, 1942 also reported that she was a member of the Governor William Livingston Chapter of the Daughters of the American Revolution, in Spring Lake. Her body was brought to Lewes, to the Atkins Funeral Home, and funeral was held at the Goshen Methodist Church in Milton on September 19th. She was laid to rest in the Goshen Methodist Cemetery in Milton. The photographs at right are “cabinet cards” of Margaret made by the well-known Philadelphia photographer Philip Edward Chillman. The one at near right was sent by Margaret as a Christmas greeting to “Dona,” which was Fredonia Wilson Lofland’s nickname. The relationship between Margaret and Dona may have continued for some time after the former eloped with John Fisher. Many of his P. E. Chillman’s cabinet cards survive and are offered for sale on line and at auction. Margaret’s portrait by Chillman was likely to have been made around 1890 or later, when she was living in Philadelphia as the wife of John Fisher. He was postmaster at Milton from 1885 to 1889, and having lost his wife immigrated to-Spanish Fork, Utah. There he became identiﬁed with politics, and was such a good worker that he succeeded in getting the appointment as postmaster of that town over his polygamist competitors. (Mr. Mustard was a Gentile then, and is yet for aught I know). That office he held from 1893 to 1897, when by the force of circumstances, and the inevitable decree of a political succession, he was superseded by another. Mr. Mustard then returned to Delaware. Subsequently he went to Philadelphia, and engaged at his present business. He is in comparatively ill health, and his present visit to Milton is as much for recuperation as anything else. John had four children by his first wife, Martha Veasey (1859 – 1889). After her premature death, he pulled up stakes and went to live in Utah, where he again served as postmaster in the town of Spanish Fork, and was a captain in the Utah militia cavalry, Troop B. 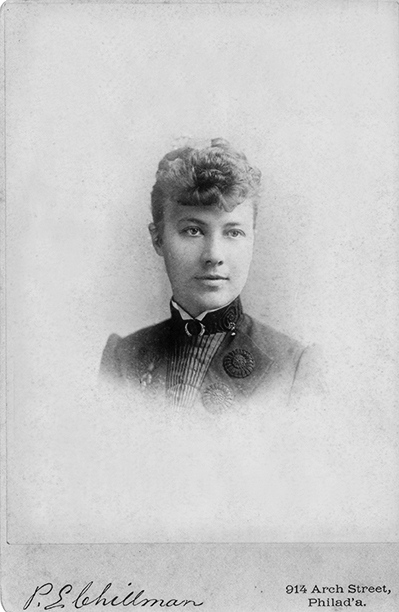 When he returned to the east coast, he married again, to a Utah woman named Emma Simons (1879 – 1945). They would have four children together. Ultimately, he would resettle in Milton and serve as town supervisor, postmaster, and Justice of the Peace. The cabinet card (Fig. 16) was made in Provo, Utah. The exact identity of the photographer has yet to be firmly established, even with the name and address imprint on the cabinet card. George Edward Anderson, a prominent Utah photographer in the latter decades of the 19th century, is one likely possibility. 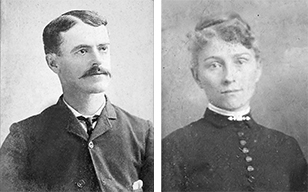 The photos below depict John C. Hazzard (1821 – 1893), a surveyor, his wife Charlotte Mary Spry Parker (1827 – 1888), and their son Ira Hazzard (1869 – 1938), a farm manager, real estate broker, and Justice of the Peace for five years up until his death. In the photo album, Charlotte is labeled “Mary Spry.” . The direct relationship of this family with Fredonia Wilson Lofland has not been determined. However, we do know that John Coard Hazzard and Charlotte Mary Spry Parker were the aunt and uncle of Margaret Atkins Fisher, several of whose photographs are in Fredonia’s album. Ira Hazzard was Margaret’s first cousin. The photo at right is of Elizabeth Marvel Dorman (1865 – 1956). 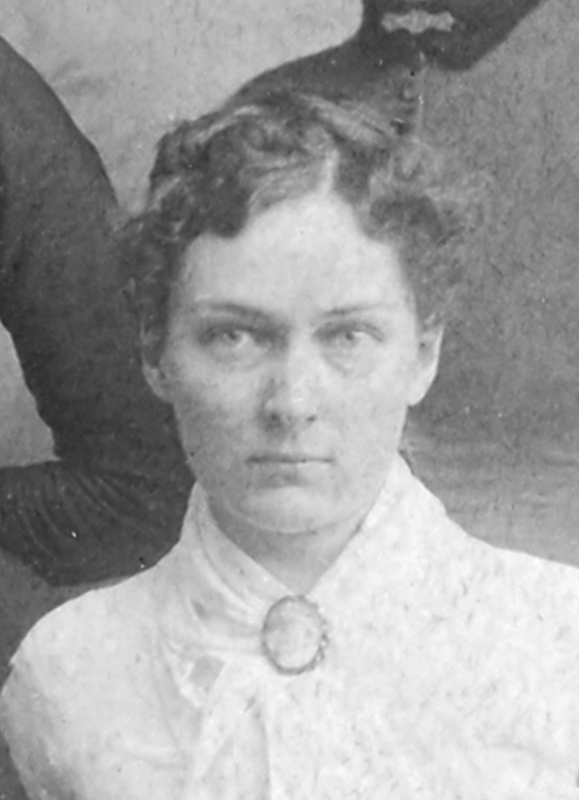 She married John T. Dorman (1863 – 1923) sometime around 1890, and had six children with him. John, a restaurant manager in Philadelphia, died of a self-inflicted gunshot wound “while temporarily deranged.” Elizabeth lived to the age of 90. Her relationship with Dona Wilson has not yet been established. 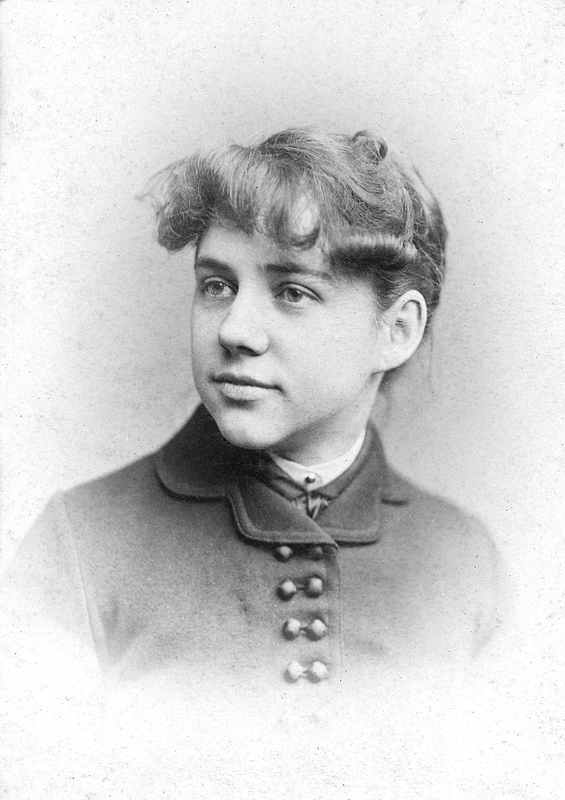 Philip Edward Chillman was known in the 1880s as the best portrait photographer and portrait painter in Philadelphia. In conjunction with a group of assistants, he created pastel, crayon, india ink, and oil portraits of many of Philadelphia’s leading citizens. The studio at 914 Arch Street was occupied by him starting sometime after 1878. The cabinet card format replaced the smaller “carte de visite” beginning around 1870. A cabinet card was a 4½” x 6½” thin sepia-toned photo mounted on card stock. 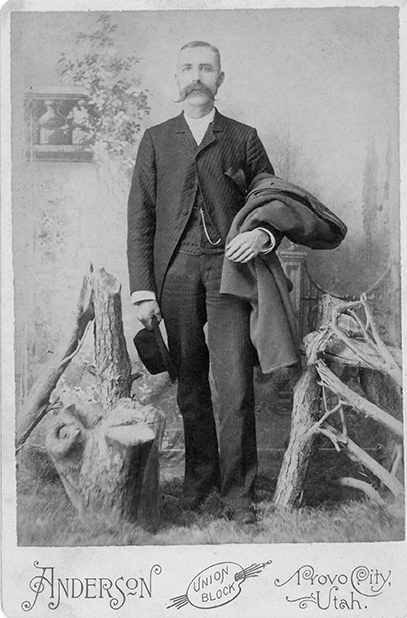 Cabinet cards achieved great popularity for portraiture in the latter half of the 19th century, even though they were originally utilized for landscape photography. The cabinet card usually had the photographer’s name and studio address in a label band below the image. The term cabinet card supposedly comes from the fact that such a portrait was large enough to be seen in a cabinet across a room.